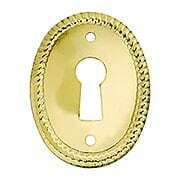 Oval Horizontal Rope-Pattern Brass Keyhole Cover in Antique-By-Hand - 1 1/8" x 1 1/2"
A classic border makes this Oval Horizontal Rope-Pattern Keyhole Cover a favorite for Colonial-Revival style furniture and cabinets. 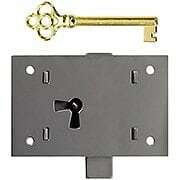 Its simple design is finely crafted from stamped brass, a great choice for desks, amoires, and hutches alike. Our exclusive Antique by-Hand finish ages gracefully over time into a beautiful natural patina. 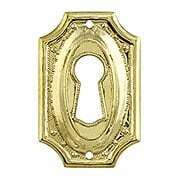 Oval Vertical Rope-Pattern Keyhole Cover - 1 1/8" x 1 1/2"
A classic border makes this Oval Vertical Rope-Pattern Keyhole Cover (1 1/8-Inch x 1 1/2-Inch) a favorite for Colonial-Revival style furniture and cabinets. 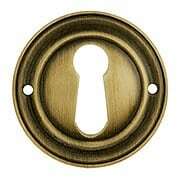 Its simple design is finely crafted from stamped brass, a great choice for desks, amoires, and hutches alike. Choose from an antique-brass finish, or our unlacquered version that ages gracefully over time, just the the antique originals. 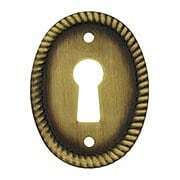 Oval Vertical Rope-Pattern Keyhole Cover in Antique-By-Hand - 1 1/8" x 1 1/2"
A classic border makes this Oval Vertical Rope-Pattern Keyhole Cover (1 1/8-Inch x 1 1/2-Inch) a favorite for Colonial-Revival style furniture and cabinets. 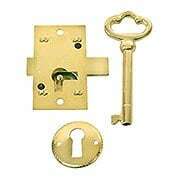 Its simple design is finely crafted from stamped brass, a great choice for desks, amoires, and hutches alike. Our exclusive Antique by-Hand finish ages gracefully over time into a beautiful natural patina. 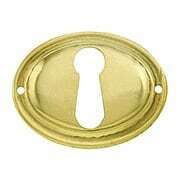 A classic ringed border makes the Round Keyhole Cover a favorite for Colonial-Revival style furniture and cabinets. 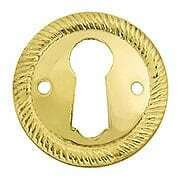 It features a simple design finely crafted from stamped brass, a great choice for desks, amoires, and hutches alike. Our exclusive Antique by-Hand finish ages gracefully over time into a beautiful natural patina. 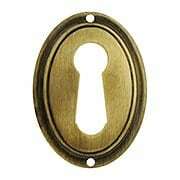 A classic ringed border makes the Horizontal Oval Keyhole Cover a favorite for Colonial-Revival style furniture and cabinets. 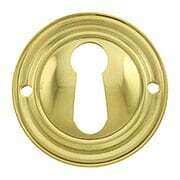 It features a simple design finely crafted from stamped brass, a great choice for desks, amoires, and hutches alike. Our exclusive Antique by-Hand finish ages gracefully over time into a beautiful natural patina. 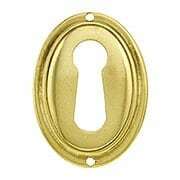 A classic ringed border makes the Vertical Oval Stamped-Brass Keyhole Cover a favorite for Colonial-Revival style furniture and cabinets. 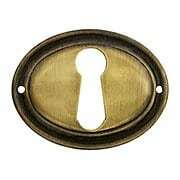 It features a simple design finely crafted from stamped brass, a great choice for desks, amoires, and hutches alike. The polished finish is left unlaquered, allowing it to age gracefully, just like the antique originals. A classic ringed border makes the Vertical Oval Keyhole Cover a favorite for Colonial-Revival style furniture and cabinets. 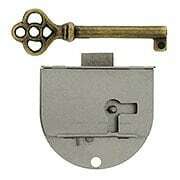 It features a simple design finely crafted from stamped brass, a great choice for desks, amoires, and hutches alike. Our exclusive Antique by-Hand finish ages gracefully over time into a beautiful natural patina. 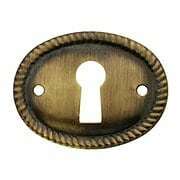 A classic border mades this Round Rope-Pattern Keyhole Cover a favorite for Colonial-Revival style furniture and cabinets. 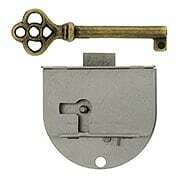 It features a simple design finely crafted from stamped brass, a great choice for desks, amoires, and hutches alike. Our exclusive Antique by-Hand finish ages gracefully over time into a beautiful natural patina. 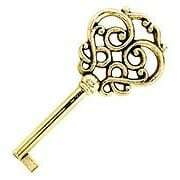 With its intricate, Victorian-style bow and solid-brass construction, this skeleton key is suited for a variety of uses - from fun to functional. Replace a broken or missing furniture key, repurpose for a decorative project, or delight wedding and party guests with their own keepsake to take home. 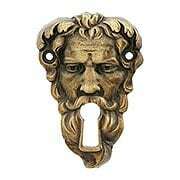 Its unlacquered finish allows it to age naturally into an antique patina. For furniture or cabinet applications, operability can only be determined by testing, therefore we recommend purchasing an assortment of keys at one time. 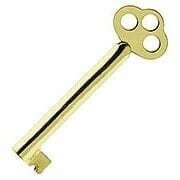 With its fashionable bow, and you're choice of a polished brass or nickel finish, this skeleton key is suited for a variety of uses - from fun to functional. Replace a broken or missing furniture key, repurpose for a decorative project, or delight wedding and party guests with their own keepsake to take home. For furniture or cabinet applications, operability can only be determined by testing, therefore we recommend purchasing an assortment of keys at one time. 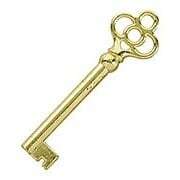 With its fanciful bow and brass finish, this skeleton key is suited for a variety of uses - from fun to functional. Replace a broken or missing furniture key, repurpose for a decorative project, or delight wedding and party guests with their own keepsake to take home. For furniture or cabinet applications, operability can only be determined by testing, therefore we recommend purchasing an assortment of keys at one time. 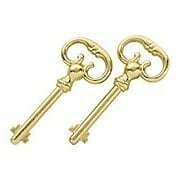 With its classic-style bow, and you're choice of a bright brass or nickel finish, this skeleton key is suited for a variety of uses - from fun to functional. Replace a broken or missing furniture key, repurpose for a decorative project, or delight wedding and party guests with their own keepsake to take home. For furniture or cabinet applications, operability can only be determined by testing, therefore we recommend purchasing an assortment of keys at one time. 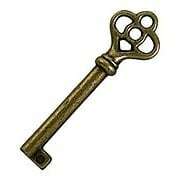 With its fanciful bow and rustic antique finish, this skeleton key is suited for a variety of uses - from fun to functional. Replace a broken or missing furniture key, repurpose for a decorative project, or delight wedding and party guests with their own keepsake to take home. For furniture or cabinet applications, operability can only be determined by testing, therefore we recommend purchasing an assortment of keys at one time. 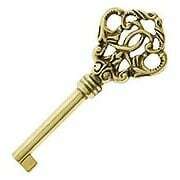 With its fashionable bow, and brass finish, this skeleton key is suited for a variety of uses - from fun to functional. Replace a broken or missing furniture key, repurpose for a decorative project, or delight wedding and party guests with their own keepsake to take home. For furniture or cabinet applications, operability can only be determined by testing, therefore we recommend purchasing an assortment of keys at one time. 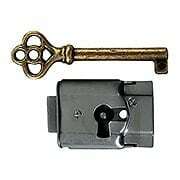 This classic clock key is suited for a variety of uses - from fun to functional. Replace a broken or missing key, repurpose for a decorative project, or delight wedding and party guests with their own keepsake to take home. 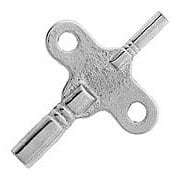 Precision cast in zinc. 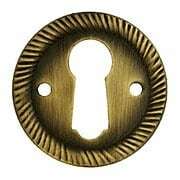 Sentinel Key Escutcheon - 2 1/2" x 1 3/4"
Our Sentinel keyhole is a fun and unique way to add the finishing touch to your desk, amoire, or cabinet. Cast in solid pewter for precise detail, it comes in your choice of three luxurious, hand-applied finishes including a silvery antique pewter, rich dark brass, or glowing antique brass. Handcrafted in the USA. 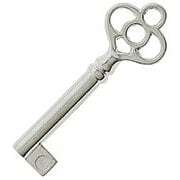 With its fanciful bow and gleaming nickel finish, this skeleton key is suited for a variety of uses - from fun to functional. Replace a broken or missing furniture key, repurpose for a decorative project, or delight wedding and party guests with their own keepsake to take home. 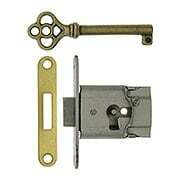 For furniture or cabinet applications, operability can only be determined by testing, therefore we recommend purchasing an assortment of keys at one time. 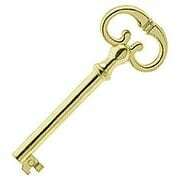 With its intricately detailed bow and solid-brass construction, this skeleton key is suited for a variety of uses - from fun to functional. Replace a broken or missing furniture key, repurpose for a decorative project, or delight wedding and party guests with their own keepsake to take home. 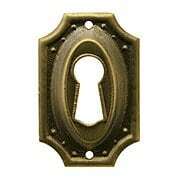 Its unlacquered finish allows it to age naturally into an antique patina. For furniture or cabinet applications, operability can only be determined by testing, therefore we recommend purchasing an assortment of keys at one time.